Achieving sustainability in the sanitation sector focuses mainly on people moving up the sanitation ladder, having access to improved WASH facilities that adapt to their specific needs and preferences across time. It is about having financially and physically sustainable access to water and sanitation (WHO, 2018). In this sense, and as it was broadly discussed throughout the conference, achieving and sustaining an open defecation free (ODF) status is more than just building WASH facilities: sustainability of sanitation outcomes in research and programming was widely related not only to scale but to long-term universal access. At the conference, many of the sessions focused on the value of understanding social preconditions as a promising approach for improving community-based interventions, such as Community-led Total Sanitation (CLTS), and therefore sustaining WASH outcomes in the long-term. However, the understanding, in the case of CLTS, was that the implementation of the approach alone might not work well in all settings; and because of that the need to encourage: i) rigorous formative research, ii) regular follow-ups and iii) the integration of approaches and practices. This speaks clearly about a WASH sector which is currently focusing on the post-ODF phase, as well as, on how to keep momentum while sustaining the achievements and learning from the mistakes. When thinking about WASH sustainability, one of the key challenges discussed was the need to think beyond community toilets to the sanitation hazards that lay ahead. There is a current need to think about the whole sanitation chain (safe containment, transportation, treatment, disposal and reuse of the faecal sludge), as well as about social and individual behaviours, rather than only about the construction of WASH facilities. However, it was also recognised within the presentation of World Health Organization's 2018 guidelines on sanitation and health that it is not just the sanitation chain we need to consider; there are other secondary barriers (such as handwashing with soap, safe drinking water, flies control and animal waste management) that need to be taken into account to prevent the disease burden and achieve sustainability. Another significant challenge identified was how to integrate approaches and practices effectively; currently collaborations and coordination among different WASH actors interested in integrating approaches are limited. Also, achieving equitable and sustainable access to WASH for the most disadvantaged and the most vulnerable was seen as another big challenge. In the case of women and girls, their engagement in interventions seems to be currently limited to how WASH programmes benefit, overlooking how women and girls get specific needs met through interventions (i.e. too often women's needs are reduced to focusing exclusively on menstrual hygiene management). The need to be more critical in the approach to gender and to gender equality was discussed, with a recommendation to move away from research and programming which cannot distinguish gender inter-sectionalities. As presented by CARE International, a lack of gender awareness and understanding can result in exploitation and harm by reinforcing unbalanced norms, roles and relations. An unrefined gender approach could also end in neutral/blind research and practice which ignores the differing sanitation and hygiene needs of men, women, girls and boys, also overlooking difference in sexual identities within this and the associated challenges to access and use. The lack of financing mechanisms and technologies that adapt to the context and needs of the community members was also seen as a current challenge to sustainable sanitation outcomes. Participants working with community-led approaches highlighted the difficulty to define the communities they were working with, as the typologies of areas, types of government, culture and social norms vary from site to site. In-depth community assessments and regular follow-ups could contribute to a full understanding of the technologies and financing strategies that can better suit a specific setting. Furthermore, during the conference the challenge of linking institutional to individual change was also underlined. The limited amount of partnerships between implementation agencies, donors and locals makes it difficult for them to create a shared vision of the sector, it also limits the development of financial strategies and market opportunities that could better contribute to more communities maintaining ODF sustainability in the long run. The need to move from a sensitive towards a transformative WASH approach was also discussed. 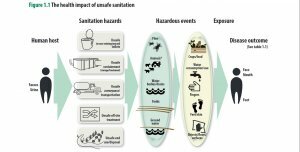 This suggests focusing on the sanitation systems, going beyond the benefits of WASH in sanitation research and programming, and eliminating the less safe forms of sanitation. As presented by the John Hopkins Bloomberg School of Public Health, the trajectory from a sensitive to a transformative approach could relate to having: i) a more intense and frequent behaviour change communication (BBC) approach, as well as, ii) more effective technologies which relies less on BCC and reduces barriers to hygiene; as for example the case of Skywater, enterprise which provides atmospheric water generators which supply 2000 liters of water per day. Furthermore, computer-based technologies are making it easier to share information between donors, partners and beneficiaries, which is starting to change partnerships and the way information is presented. In this sense, technology can not only help to accelerate the sanitation process but also make it accessible, affordable and sustainable over the years to come. Transformative approaches to WASH were also seen to encourage stronger governance, management and efficiency of the human system that delivers BCC and innovative technology, taking special consideration for the enhancement of local leaderships. For CARE International, when talking about gender and equitable access to WASH, a transformative approach is also connected to transforming harmful gender norms, roles and relations. For example, going beyond counting women to including women in planning and design of WASH interventions, as well as having WASH research and programming that contribute to gender empowerment. World Health Organization (WHO) 2018. Guidelines on sanitation and health. Geneva: World Health Organization. Creative Commons Licence: CC BY-NC-SA 3.0 IGO.